Vésigniéite: Mineral information, data and localities. 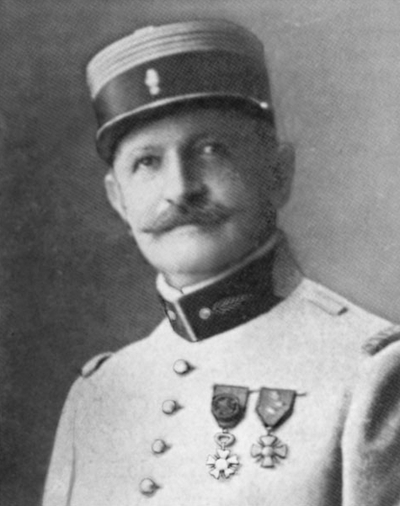 Named after Louis Paul Louis Vésignié (3 June 1870, La Ciotat, Bouches-du-Rhone, France - 25 August 1954), mineral collector and President of the Mineralogical Society of France. He assembled one of the finest collections in the world for his time. Portions of his collection went to the Sorbonne and the Natural History Museum in Paris. Lamellar pseudohexagonal crystals, botryoidal aggregates, powdery. Malachite 13 photos of Vésigniéite associated with Malachite on mindat.org. Tenorite 5 photos of Vésigniéite associated with Tenorite on mindat.org. Cuprite 4 photos of Vésigniéite associated with Cuprite on mindat.org. Sulvanite 3 photos of Vésigniéite associated with Sulvanite on mindat.org. Baryte 3 photos of Vésigniéite associated with Baryte on mindat.org. Quartz 2 photos of Vésigniéite associated with Quartz on mindat.org. Volborthite 2 photos of Vésigniéite associated with Volborthite on mindat.org. Roscoelite 1 photo of Vésigniéite associated with Roscoelite on mindat.org. 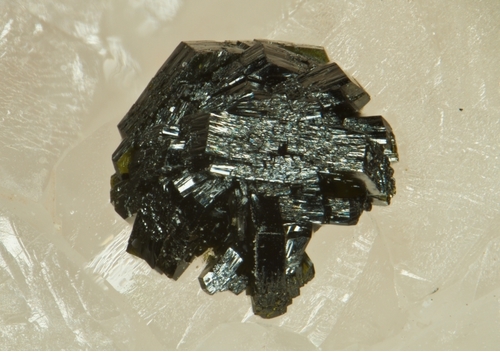 Magnetite 1 photo of Vésigniéite associated with Magnetite on mindat.org. Calcite 1 photo of Vésigniéite associated with Calcite on mindat.org. Guillemin, C. (1955) Une nouvelle espèce minéral: la vésigniéite, Cu3Ba(VO4)2(OH)2. Comptes Rendus Hebdomadaires des Séances de l’ Académie des Sciences de Paris (1955): 240: 2331-2333. Guillemin, C. (1956) Contributions à la minéralogie des arséniates, phosphates et vanadates de cuivre. II. Phosphates et vanadates de cuivre. Bulletin de la société française de Minéralogie et de Cristallographie: 79: 219-275. American Mineralogist (1955) 40: 942. Guillemin, C. and Johan, Z. (1976) Étude radiocristallographie de la vésigniéite, Cu3Ba(VO4)2(OH)2. Compt. Rendus Acad. Sci. Paris: 282: 803–805 (in French). Neues Jahrbuch für Mineralogie, Abhandlungen (1987) 157: 245-266. Zhesheng Ma, Ruilin He and Xiaoling Zhu (1990) Redetermination of the crystal structure of vesigniéite. Acta Geologica Sinica: 64: 302–308 (in Chinese with English abs.). American Mineralogist (1992) 77: 675. Colman, R., Bert, F., Boldrin, D., Hillier, A., Manuel, P., Mendels, P., Wills, A. (2011) Spin dynamics in the S = 1/2 kagome compound vesignieite, Cu3Ba(VO5H)2. Phys. Rev. B: 83: 180416. The following Vésigniéite specimens are currently listed for sale on minfind.com. Moravec, B., Pauliš, P.: Vésigniéit ze Studence u Jilemnice. Časopis pro mineralogii a geologii, 1990, roč. 35, č. 4, s. 430-431. Handbook of Mineralogy - Anthony, Bideaux, Bladh, Nichols; Schneider, G. I. C., & Lauenstein, H. (1992). 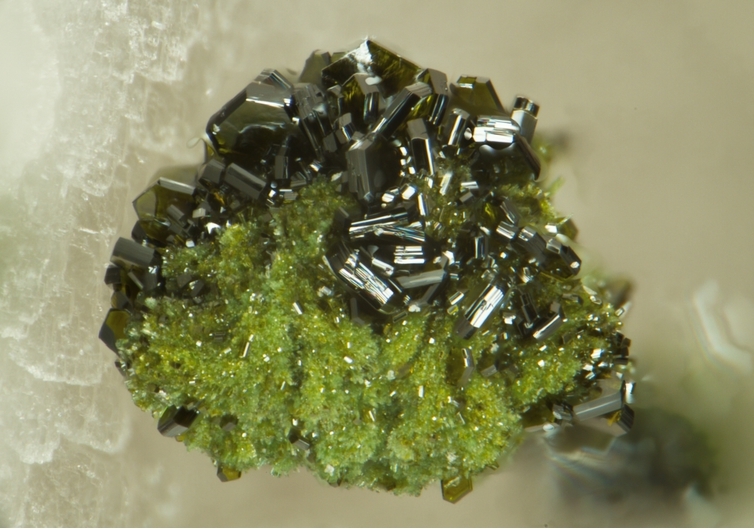 A new occurrence of vesignigite from the Gorob-Hope copper deposit, Namibia. Mineralogical Magazine, 56(382), 67-69. Stalder, H. A., Wagner, A., Graeser, S. and Stuker, P. (1998): "Mineralienlexikon der Schweiz", Wepf (Basel), p. 425. 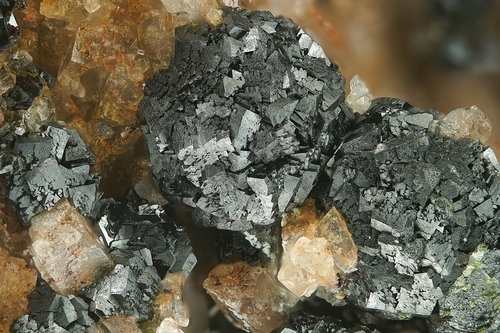 Handbook of Mineralogy - Anthony, Bideaux, Bladh, Nichols. ; Embrey, P.G. (1978) Fourth Supplementary List of British Minerals. Mineralogical Magazine, vol. 42, n° 169-177; King, R.J. and Wilson, R.N. (1976) An occurrence of vésigniéite in Leicestershire. Mineralogical Magazine, vol. 40, n° 313, 533-535.; Ince, F. (2005) The mineralogy of Newhurst Quarry, Shepshed, Leicestershire. Journal of the Russell Society, vol. 8(2), 47-65.; Green, D.I., Hubbard, N., and Ince, F. (2008) A review of the occurrences of the copper vanadate minerals volborthite and tangeite in the British Isles. Journal of the Russell Society, vol. 11, 54-58. BMS Collection; Neil Hubbard collection; National Museum Wales collection; Specimen L1436 in the Leicester University collection; Green, D.I., Hubbard, N., and Ince, F. (2008) A review of the occurrences of the copper vanadate minerals volborthite and tangeite in the British Isles. Journal of the Russell Society, vol. 11, 54-58. Turner, R.W. and Rumsey, M.S. (2010): Mineral Relationships in the Mendip Hills. Journal of the Russell Society, vol 13, pp 3-46; Rumsey & Turner, Russell Soc Newsletter #51, Sept. 2007; Bull. Br. Mus. Nat. Hist. (Geol.) 40 (5) : 247-258 Turner, R.W. and Rumsey, M.S. (2010): Mineral Relationships in the Mendip Hills. Journal of the Russell Society, vol 13, pp 3-46. Anthony, J.W., et al (1995), Mineralogy of Arizona, 3rd.ed. : 414. Anthony, J.W., et al (1995), Mineralogy of Arizona, 3rd.ed. : 147, 150, 296, 311, 405, 414; Wenrich, K.J. & H.B. Sutphin (1989), Lithotectonic setting necessary for formation of a uranium-rich, solution-collapse breccia-pipe, Grand Canyon region, AZ, USGS Open File Rept. 89-0173.